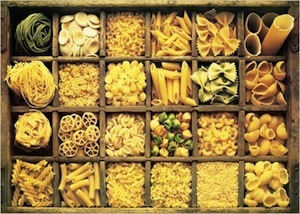 quantities of dried pasta in a myriad of shapes and sizes. resides in the dairy case. ﻿﻿﻿﻿This obsession with shapes and sizes of pasta permeates the culture. I once encountered a woman in a grocery store shortly before Christmas. She searched for a specific size of spaghetti. Spaghetti comes in many sizes, numbered roughly from one (what we Americans call “angel hair”) to thirteen, a very thick noodle indeed. I think she wanted size six and the store had only size seven. That just wouldn’t do. It didn’t go with the sauce she planned to serve. I’ve always preferred the smaller types, angel hair and such, simply because they cook faster—in about three minutes, but I’m developing an appreciation for the thicker varieties after so many years here. Some of these can take fifteen minutes to cook. Tradition governs which type of pasta should accompany which type of sauce. I’m not an expert on this topic, and I have to admit that my eyes glaze over when someone tries to explain. I think, but I’m not really sure, that you should use ridged pasta with creamy sauces and smooth pasta with chunky ragu or vegetable pasta. Early in my days in Rome, I bought a series of books issued weekly with the newspaper featuring only pasta dishes. I didn’t get the index until the series ended. Imagine my surprise, and frustration, when I discovered the index was arranged by pasta shape only. You couldn’t look up “eggplant” or “rabbit” to find recipes by ingredient. The index listed fusilli, mezze maniche, bavette, pappardelle. One commercial pasta company here charges high prices for their dried pasta because it’s made with zinc rollers. Apparently the zinc roughens up the pasta surface in a way that steel doesn’t. or plow through pesto with gusto. So much for my lesson on pasta shapes. I do love pasta, but I must admit all the shapes confuse me. I really like the lighter ones, but maybe it's because I use the wrong sauces. How about a lesson on which pasta with which sauce, Patricia? I could certainly use one. Ellis, I'm not an expert in this department. The idea is to have a shape that attracts as much sauce as possible. I think one reason my friend Diana Collins may love fusilli so much is that it really holds the sauce. What an interesting post, Patricia. I am a huge fan of pasta and would e happy eating it every day. :) There is an Iranian dish that is a bit like spaghetti bolognese except that it's cooked exactly like Persian rice, including the crispy layer on the bottom of the pot. It's called "Macaroni", although it can be made with any shape of pasta. 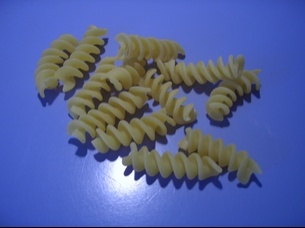 In Italian, macaroni, or maccheroni as it is often spelled, refers to all types of pasta. Patricia! What a fun post. I was blown away by the double aisles of pastas, and the understanding that wasn't all of them. Gracious. I also tend to gravitate to angel hair pasta for the quickness factor. I'm part of the instant generation. Enjoyed it! Glad you enjoyed it. The variety is amazing. And I hadn't noticed until I took the photo that blue is the color no matter what the brand. That's true in the dairy case, as well. I just finished reading Seeing Red. Complimenti, as the Italians say. Really enjoyed your article about pasta. Am now preparing dinner and pasta is on the menu for tonight. I boiled a broccolo romano and am going to ripassare in padella with some smoked pancetta and garlic and hot pepper. I plan to use a “short” pasta such as mezze maniche or penne rigate. We prefer the rigata because it does “catch” the sauce better. Lots of parmigiano or pecorino and it’s done. Thanks, Federica. That sounds great. I'll try it soon. Have the smoked pancecetta in the fridge and I'll pick up some brocolo at the market. I must say that I use penne rigate more than any other pasta. What a great topic? Pasta sizes and shapes. My twin sister only eats spaghetti. She was truly amazed that I had 20 different shapes of pasta in my cabinet. It's not what I like best, it's which pasta goes with what I'm making. I love angel hair with tomato sauce, thin spaghetti for lemon and caper sauce, large noodles for lasagna, dentalini (sp) for minestrone, elbows for lentil soup, etc. Got the idea? Love your blog. Just signed on.